I eat breakfast in the pre-dawn twilight again. I got some off-brand granola in my last resupply, it tastes like shredded cardboard. I assume it still has some nutritional value and to save time and to save fuel, I add my Starbucks via Caffe Mocha powder to my granola and instant breakfast. I enjoy coffee chocolate vanilla granola. I also have some stuff called Trail Butter. Its base ingredient is coconut oil. The first time I tried it in the afternoon on a tortilla. It was not a good mix of flavors and the coconut oil was in its liquid state. For the last few days I've been eating four spoonfuls of the stuff for breakfast. It's chunky, the chunks are coffee and vanilla beans. It's better in the morning while the coconut oil is still in its solid state rather than when it gets warm and turns into a liquid with chunks, bleeeh. I leave camp and head to the stream I camped near. I wash my socks and rinse my pack towel. I am carrying a liter of water. My plan is to drink it only when I don't have a water stop close by. I will use the microfilter to drink a liter every couple of hours. I'm off. 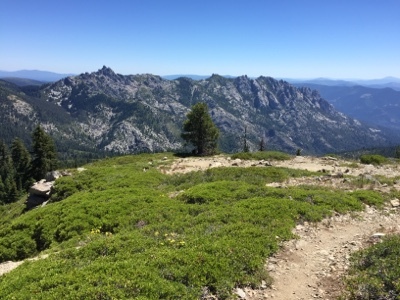 The trail climbs up the back side of Castle Crags. I think the total elevation gain is about four thousand vertical feet. I work on this most of the morning. Switchbacks, lots of switchbacks. At first switchbacks are boring, they are in the forest, not much of a view. I stop a few times for water. Drinking a liter on the spot and not carrying any more water. Higher and higher, as I get higher up the trees become less thick I can see the crags, I can see the ridges around me. I keep climbing until the crags are below me. The trees are much less crowded here. I reach the top of the ridge. The trail now starts traversing across the ridge top. No up and down through passes like in the Sierras. This is a ridge walk. I stay at elevations above six thousand feet. It's cooler, but today was a warm day. I hike on and on in the sun. I'm lathered up with sunscreen and I'm wearing my buff, hat, and sunglasses. My shirt is soaked with sweat, which is keeping me cool. My plan was to end the day at Porcupine Lake. Halfway through the day I decide I don't want to camp there. It is two tenths of a mile off trail and I don't want to have to hike to it. I also enjoy hiking this weather. Setting up a tent and trying to get into it in this sun would be blazing hot, I feel like I have a rhythm going and would like to see how far I can get. Once on the ridge the trail is not content to simply head north. I'm on a ridge I have to follow where the ridge goes. First I head west, then south, then northwest, finally north again. The sky is a brilliant blue. Mt Shasta sits like a giant to the east calmly watching the scurrying little ant cross the ridges. I scurry. Walking as quickly as my little legs will take me. Hour after hour in the hot sun. As long as I have food and water I just keep walking. I stop briefly to consume my peanut butter tortilla then I'm off again. I pass the exit for Porcupine Lake and keep heading north on the trail. Which currently really is north. Then the trail turns east. And I skirt around and above the unattractively named Toad lake. Climbing some more. I wonder how far I might have walked if there hadn't been so much climbing today. My legs and feet are feeling strong and capable. They keep up a pace that is surprising to me. How come they don't get tired? I'm tired, my legs, they'll keep going and going. I feel like people in front of me are hundreds of miles ahead, when I see someone in front of me I'm surprised. Deadfall lake is the spot on the water report with reliable water. It's also the spot with decent campsites. I get a decent campsite and set up my tent. I am amazed that I am not sore or exhausted after crushing out thirty two miles. I didn't hike any faster. I just hiked longer. Pushing myself past my anxiety zone of four pm. Which is really kind of silly that I get anxious. I had no problem finding a campsite and getting everything done before dark.